For investors who can’t stomach the volatility of investing 100% of their long-term savings in stocks, the usual advice is to put some fraction of savings into fixed income investments. Another approach is to use stock options to protect against large losses. Suppose that an investor Irene has $100,000 that she wishes to invest mostly in large US stocks, but is nervous about losing money. One approach for Irene is to just put all of her savings into the S&P 500 (which is sitting at 900.80 as I write this) and live with the volatility. The following chart shows the returns for Irene across a range of possible outcomes in the S&P 500. We’ll focus on her results as of June 2010, a little over a year from now. It’s the lower left hand corner of this chart that worries Irene. The thought of losing that much money is scary. One solution is for Irene to put some money (say 30%) into fixed-income investments. The following chart compares the all-stock approach to the 70/30 approach assuming that the fixed income return will be 2% over the next year and a bit. Now Irene’s potential losses are blunted and she can sleep a little better at night. The down side is that her potential gains are reduced as well. But, this is the price that nervous investors pay for some peace of mind. A different approach to limiting losses is to use stock options. Irene could buy put options on the S&P 500 that would allow her to sell her stocks at a specified price if they happen to drop in value. 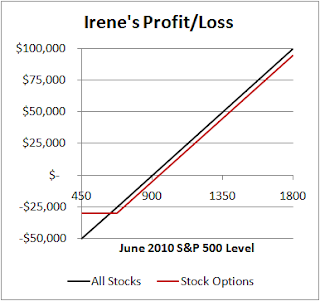 For example, Irene could buy put options struck at 675. For a June 2010 expiry, the current price of these put options is $45.20 each. The following chart compares the all-stock approach to the stock plus put options approach. 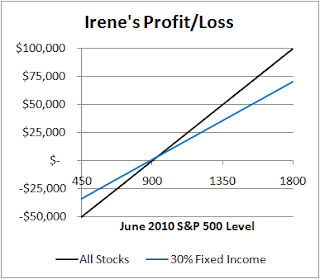 By giving up about 5% of her returns, Irene can cap her losses at about 30%. If this doesn’t seem like a good idea to you, I agree. The 5% she is giving up represents about half of her expected returns (if we believe that expected stock returns are 10%), and a 30% loss is not particularly likely. 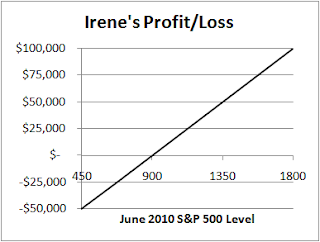 A 30% loss would still sting badly, and Irene might prefer to cap her losses at some lesser percentage. Unfortunately, the cost of the put options to cap losses at less than 30% is even higher than 5% of her portfolio. This put option approach to insuring against losses looks less attractive than the 70/30 fixed income approach. It could be that recent market volatility has driven up the price of stock options. In current conditions, put options as portfolio insurance look like a poor choice. Nervous investors will have to stick with fixed income investments or search for some other stock option strategy for portfolio insurance. But, if willing to accept a maximum profit potential, then you can sell a call option, changing the position into a collar. That call grants someone else the right to buy your S&P assets at a given price, limiting profits, but you can collect enough cash to pay for the put. Insurance at zero cost out of pocket. The cost is not maxing returns when markets are in surge mode. Bottom line: collars provide all the protection you need to prevent a disaster, and allow to you to make good money when the markets rally, significantly outperform when the markets are stable or decling a little, and vastly outperforming when another 2008 rolls around. That must be a better deal than buy and pray. True, you will do less well when markets surge, but how often does that happen? And you will make enough to be pleased (unless you are of the porcine variety). If you are going to lose nearly half of your assets during a 2008 repeat, you will not do well enough in bullish years to compensate. True, those surging years feel good when you are long, but the collar owner outperforms in all other market types - and the year 2008 ought to demonstrate the need to protect assets.